Bias alert: I am an enormous Coen Brothers fan. I’m a list maker, and nearly any way I look at it, they are my favorite filmmakers, creating unique works of uproarious comedy, grim drama, and surreal symbolism. However, I was a bit skeptical going into this one. I’m very passionate about the music I enjoy, and folk music is pretty far down my list. Like way down. I joked on the podcast once that I agreed with John Goodman’s character in the trailer: “Folk songs? I thought you said you were a musician.” I just find the bulk of it overly simplistic, boring, and repetitive. So, I was a bit hesitant, but fairly confident in Joel and Ethan Coen. 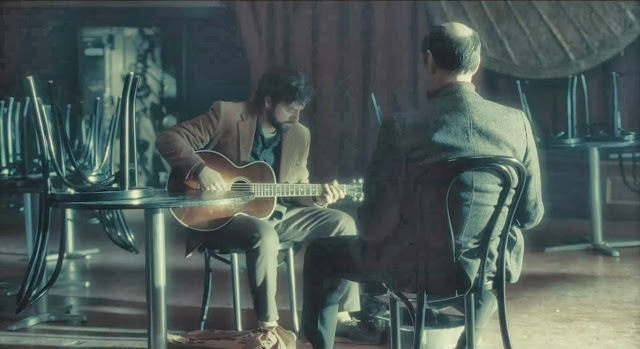 The film follows Llewyn Davis, a down-and-out folk singer in New York City in 1961. While some of the key plot points of the film focus on his struggling career as a musician, most of the movie captures the in-between: sleeping on couches of friends, hitching rides with near strangers, and making poor decisions left and right. Llewyn deals with personal problems as well as financial ones, and goes on a journey that seems to sweep him along, inexorably leading him on to the next troubled portion of his life. Llewyn is played expertly by relative newcomer Oscar Isaac, who brings a sense of tired tragedy to the role. He is a little quiet, but has a sense of humor and makes the character live and breathe through subtle actions and reactions and gives the simple logline “down-and-out folk singer” an enormous amount of depth that defies simple description. The supporting cast, while small, is full of wonderful Coen characters: the bitter and swearing Jean (Carey Mulligan), the painfully upbeat Jim (Justin Timberlake), and the infinitely obnoxious Roland Turner (John Goodman) all bring interesting bits to the story, and really help recreate the atmosphere that the movie strives for. Many bit parts played by some new (but sure to be recurring casting choices by the Coens) bring a great sense of humor to the story. Inside Llewyn Davis is rich with understated subtext and repeated imagery that make it worthy of lots of thought and post-theater discussion. 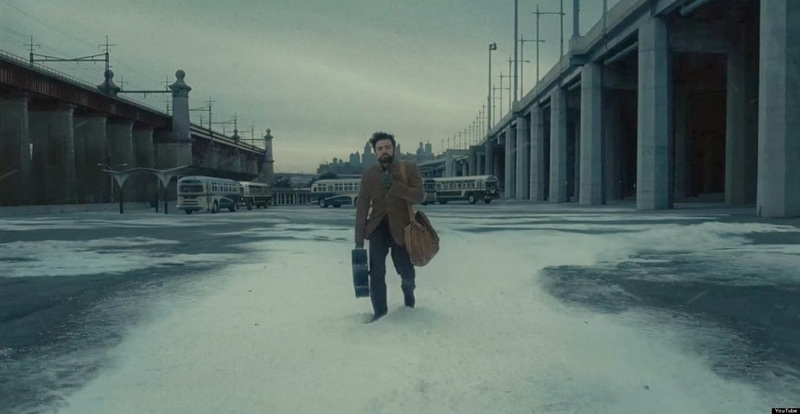 There’s an odd, almost surreal sense of time in the movie, and we get the sense that this period in Llewyn’s life is just like any other, and that he will always be stuck in this sort of homeless, jobless limbo. There are many bits of information that, in a more blunt film, might be clunkily explained in the exposition, but here we get them along the way or are left to figure them out based on bits of conversation. Most interesting of all, perhaps, is the recurring use of the cat as imagery or metaphor, as an orange tabby (is it the same cat each time?) pops up in Llewyn’s life from time to time, wreaking havok, bringing people together, and most of all giving us wordless bits of character work through Llewyn’s interactions with it. There is a sense of grand mythology at play in the simple tale, and while there are hints at greek classics, it is much less 1:1 than Oh, Brother Where Art Thou, though the films have a lot in common. Then there’s the music. Although I’m no fan of folk, I can admit that there is some fine music in the film. Isaac does a fabulous job singing traditional songs that add further emotional depth to his character, his wavering voice telling more than the words could. While there are a few spots that feel a bit forced (I’m looking at you, Carey Mulligan), most of the music in the film feels real and true to the time and place. I’m an audio guy, so you’ll have to excuse this, but the way the music was recorded has just about the right warmth and space to recreate that era and those recording methods, something that I very much appreciated and enjoyed. However, I think anyone could really enjoy these warm, beautiful songs, particularly as an escape from the freezing weather both in the film and outside the theater. So that’s my take, without spoiling too much. Much like many films in the Coens’ oeuvre, it has the ability to make you laugh not too long after it deals an emotional blow. It’s a truly fine film, one that I will most definitely have to see at least once or twice more before I can really begin to piece together some of its meaning. Is a life without art without meaning, or is even the most passionate, dedicated artist always moving in a cycle with no end? In one poignant scene, Llewyn talks to his sister about his career. He scoffs at her suggestion that he quit and rejoin the merchant marines: “Quit? And just...exist?” That’s what this film truly examines, and the brilliant, dark, funny look at a tortured artist is one that is sure to top many movie lists for years to come.